Say hello to Jazz! 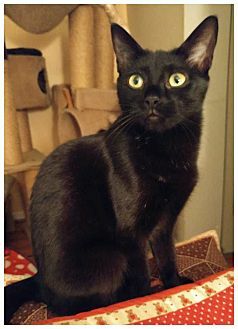 He is a handsome young cat who is looking for a home. Jazz was found outside in the cold and snow and came up to a door pleading to be let inside. His life motto is “If opportunity doesn’t knock, build a door” -Milton Berle. Jazz took it upon himself to put this motto into action. He is very snuggly and adores being around people. He will curl up on your lap and snuggle in close. Jazz is looking for a home where he can stay warm and loved for the rest of his life.